Closets or cupboards help to store our stuff like the clothing, footwear, and other fashion accessories amazingly with an ease of find and pickup also! According to space in possession, everybody just wants to own a custom closet or cupboard design with smartly built storage options like shelves, compartments, cloth hanging racks and drawers! 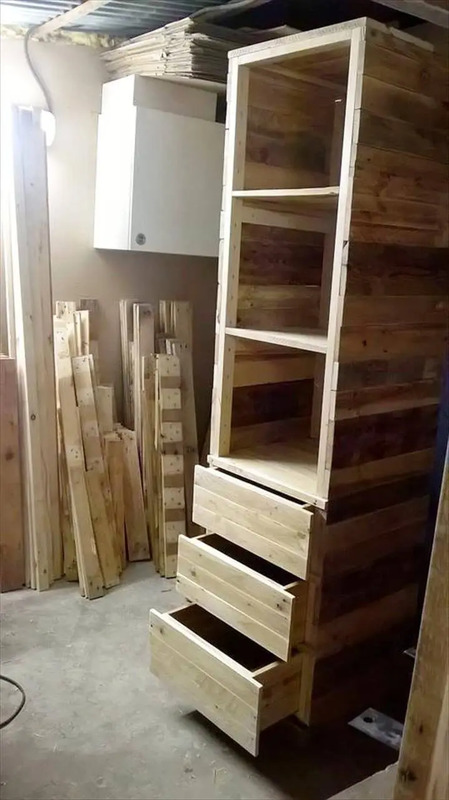 If you are really willing to have a featured one in wood medium and also with a custom size and dimensions, then we’ll recommend you to take a start with pallets, would the best idea ever to save bundles of money on furniture costs! 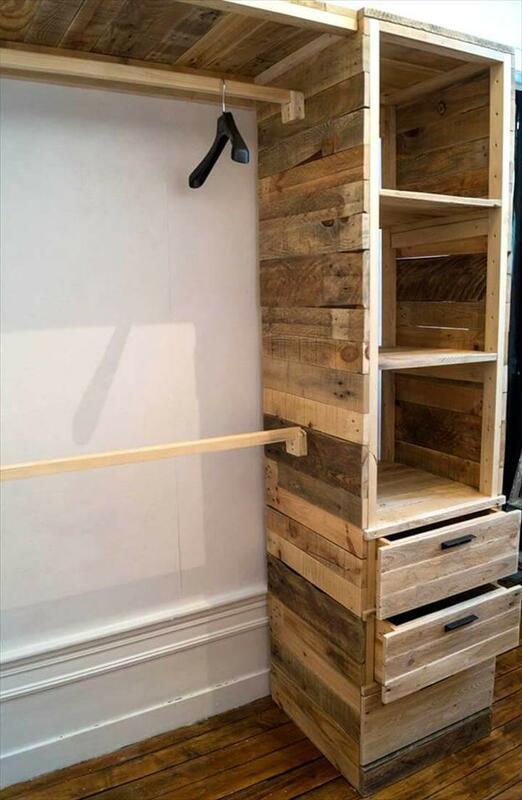 We would like you to see the details of this DIY pallet corner cupboard or closet design, fabricated with pallet wood pieces and slats put together smartly! This corner closet offers a cloth hanging sections, a side cupboard with 3 drawers and 3 storage compartments! There is a top level also to store more of your items like the luggage bags and cloth trunks! 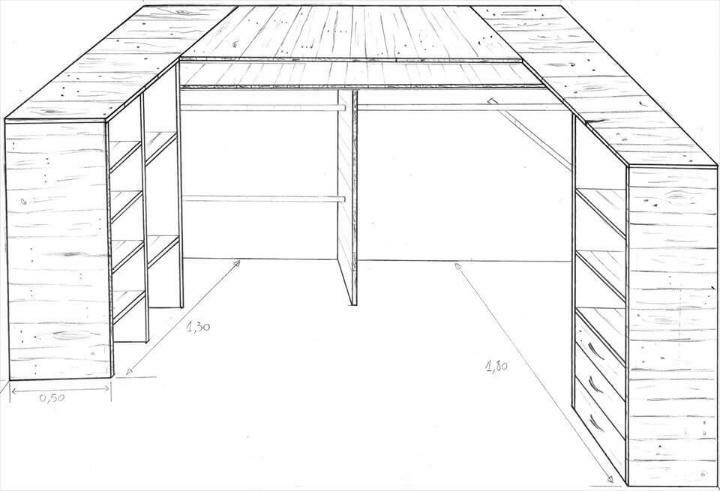 Here main attention has been given to construction details, so you can easily clone it at home by getting the required material in stock, pallets would be most important, we have also shared here a construction plan which guides you that how you can enlarge this closet to suit your storage needs! 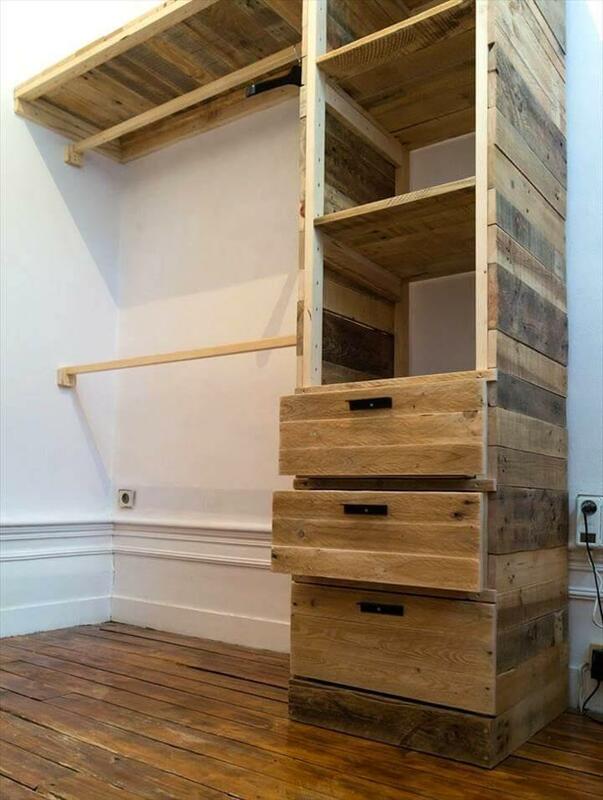 It would just be the marvelous addition to your dressing room, all the style and fashion loving boys and girls would just love this pallet closet for sure! The cupboard storage portion or unit has been built separately and is having a tower like shape which offers smartly built-in storage compartments and drawers! To one side of it facing the corner wall, custom mini wooden supports have been fixed for installation of cloth hanging section! Here two longer wooden beams have been made hanged between the storage tower and corner wall for beautiful cloth hanging racks! Mini wooden supports have been screwed in the side wall of storage cupboard tower and comes with already made cuts that beautifully holds the cross wooden supports, got for cloth hanging! 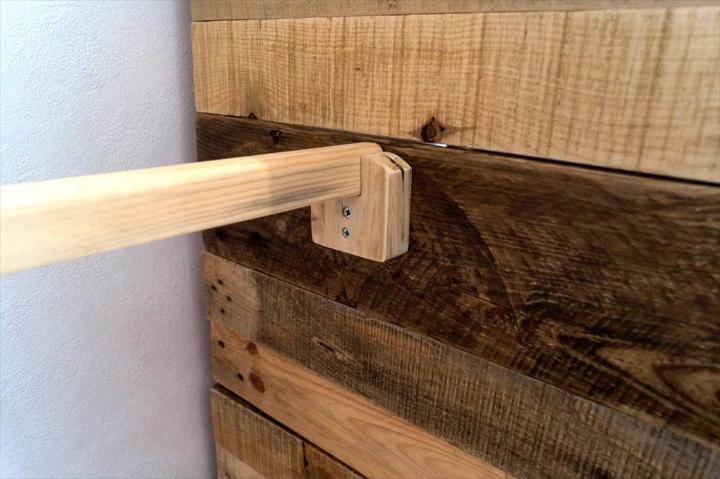 A custom wooden slab has been made having length equal to top of storage tower to corner wall area, it hangs on wooden supports fixed tight along the corner wall area, this help the storage tower to get connected strongly to wall area! 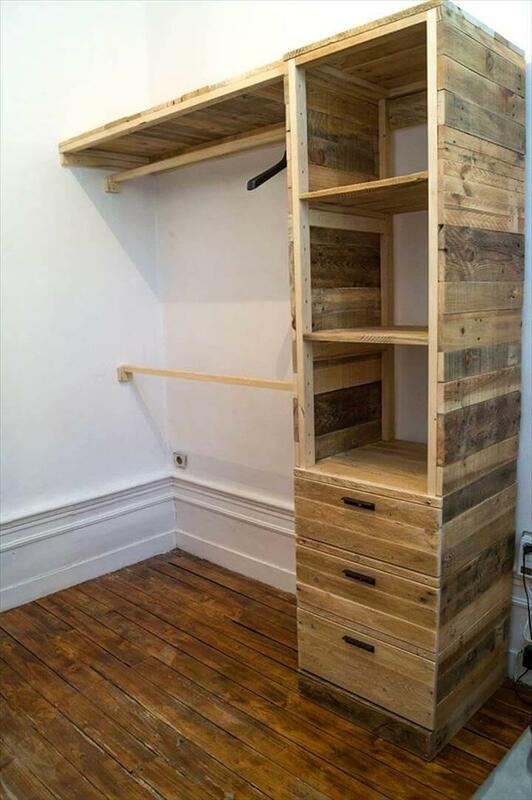 This wooden slab also results into a bigger shelves which can be targeted for larger types of storage! 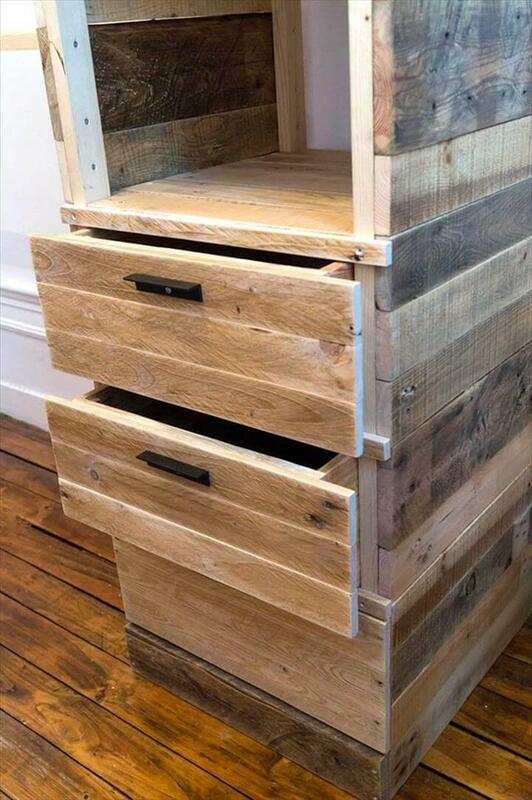 3 built in cupboard drawers have been made super easy to open by providing metal handles, fixed in place using cross headed screws! Would really be amazing to secure your fashion accessories you cherish a lot! Here is the plan which will guide you for all the tiny details while extending this corner cupboard to a walk-in closet! You can also take a review here for the necessary dimensions!